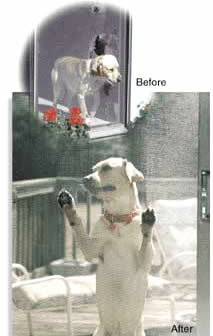 Pet Screens & Doors that Withstand Any Furry Friend! 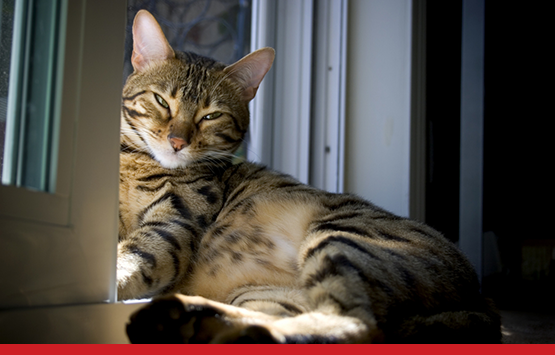 Are you tired of replacing your patio screen door, because of your pets? Customers with pets will be sure to appreciate Metro Screenworks excellent pet screen & pet doors. Pet screen is made of vinyl-coated polyester, which is 7 times heavier than the traditional fiberglass and aluminum wire of patio screen doors. Pet Screen is resistant to tears and damage caused by household pets and is sold in full rolls of 100 feet as well as in smaller rolls. Standard pet custom screen colors are black and gray, but wide variety of colors are available in full rolls. Save your patio screen door with pet doors which install right in to your screen so your dog can still get out, by himself. Protect your home's screen doors with METRO Screenworks Factory Direct Pricing. Call today with any questions. Save your patio screen door with pet doors which install right in to your screen so your dog can still get out, by himself. Protect your home's screen doors with METRO Screenworks Factory Direct Pricing. Call today with any questions. If you are a pet owner with shredded screens, you may feel that spending time and money fixing your screens is just a part of life. However, this isn’t the case. Taking care of your home and having pets doesn’t have to be mutually exclusive and we at Metro Screenworks have solutions for your window screens and screen doors, so you can spend less time and money on replacement window screens and more time with your pet and family. The catio or cat patio is the perfect way to spoil your kitty. It provides a safe place to let your fur baby play and enjoy the sun. No matter the size of your home or your cat’s habits, you can build a catio that fits your budget and your kitty’s needs. Learn more about catios and be sure to shop Metro Screenworks for all of your catio design needs. Whether you’ve built an outdoor cat enclosure and are looking to upgrade it or are just starting to look at catio design ideas, pet screen and super screen are some of the best building materials to keep your catio looking and functioning at it’s best. Pet screen is seven times stronger than a regular screen and engineered to withstand pet paws, claws, and teeth. It can supplement chicken wire structures to keep bugs and other pests out of your catio. Super screen is three times stronger than a regular screen and can provide better protection against pets and weather elements such as hail. Super screen is perfect for screening any outdoor enclosure for long-lasting pest-protection. Pet screen is a heavy duty solution that can allow you to say “goodbye” to ripped screens and “hello” to protection against six- and eight-legged pests. Pet screen is made from vinyl-coated polyester which means that it is seven times stronger than fiberglass and aluminum screening material; pet screen can withstand claws, teeth, and other stresses that pets put on screens, making it perfect for replacement window screens and screen doors. 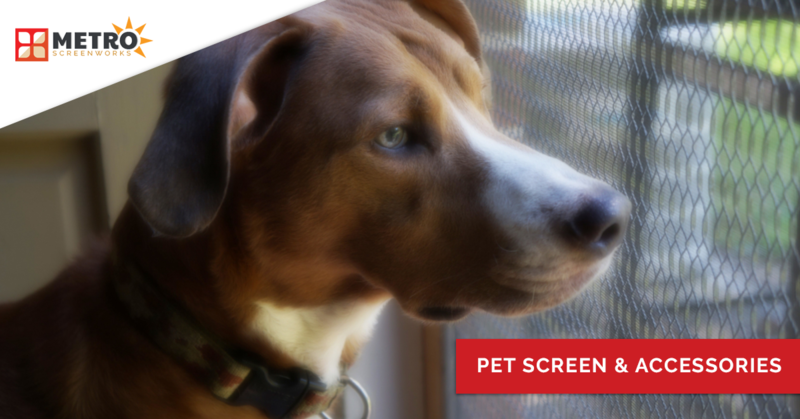 Pet screen, however, isn’t just for pet owners. This screening material is perfect for other projects that require heavy-duty, structured materials. Use pet screen for making a hammock, pet beds, bags, hats, patio furniture, and more. 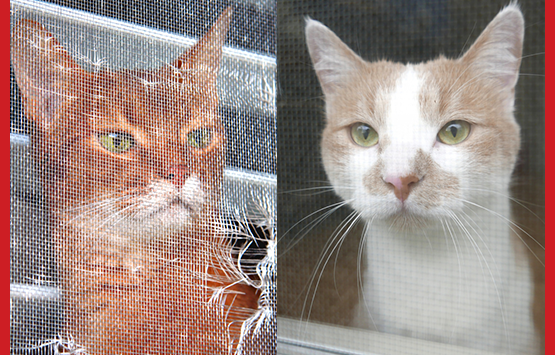 We offer pet screen in traditional window screen mesh colors, as well as other colors! If you aren’t much of a DIY-kind of homeowner or don’t want to deal with the assembly process, Metro Screenworks also offers complete window screens. Because we offer custom screen solutions, we can provide you with a customized screen with the window screening material that fits your needs. Super screen is one step below pet screen in durability, but do not let that fool you! Super screen is still one of the toughest screening materials on the market. Super screen is also a vinyl-coated polyester, but it isn’t quite as thick as pet screen. It can— like the pet screen— withstand hail, wear and tear of pets, and can reduce solar heat and UV rays. Like pet screen super screen is available in rolls, our complete window screens, and unassembled and assembled sliding screen doors. One of the reasons that sliding screen doors end up with holes and tears from our pets is due to our cats and dogs scratching to be let outside. Save your screen door and yourself some time and install a screen pet door. Our pet door can be installed in any screen door and keeps the flies, mosquitoes and other pests out, while letting your pet out whenever they please. Made from durable plastic and super screen, our pet door opens easily and stays shut when not in use. We don’t just offer pet screen in traditional black, but we provide pet screen in multiple colors! Use our pet screen for craft projects like creating a hammock, durable pet bed, and other projects. We offer a variety of color options in various screen roll sizes. Order online today! If you have a pet who takes their toll on your screens, it can be easy to throw up your hands and decide that your screens are never going to be whole and put up with the pests that make it through your ripped window screens and screen doors. However, you really shouldn't. There’s a reason for our screens and many of our modern users don’t realize how revolutionary our screens are. Screens first came to be around the time of the Civil War and with their increased use throughout the years, diseases carried by pests became less and less widespread. Flies, mosquitoes, and other bugs could no longer bite and infect the food of the people who lived inside. Though today, we have better medical care that can easily treat many of the diseases carried by six-legged pests, there are still diseases, such as West Nile, carried by mosquitoes that can cause severe long-term damage and even death. It is incredibly important that we continue to use window screens and sliding screen doors to protect us and our families from diseases and to keep misguided critters such as curious squirrels out of our homes. Measure For a New Screen? Metro Screenworks in an online screen store based in Englewood, Colorado that has, for over 40 years, provided homeowners, business and building owners, contractors, and others with window screens, sliding screen doors, and other screening products. We pride ourselves in offering not only custom, high-quality screen options, but also providing them at affordable prices. We have all that you need to get the job done. Shop our inventory online and call us if you have any questions about any of our products. Want to see it before you order it, request a sample! Want to learn about window screens, sliding screen doors, and more? Read the Metro Screenworks blog! We post regularly about all things screen-related! In our blog, you can find home maintenance tips, screen installation tricks, health facts, history, and more. We always hope to inform and sometimes even entertain. Read recent blog posts below or check out our archives to find specific information. Can’t find what you're looking for? Check out our FAQ page! You can always feel free to contact or call us!